Permanent Secretary of the Ministry of the Presidency (MOTP), Mr. Omar Sharif has been sent on leave by Minister of State, Mr. Joseph Harmon. Sharif is a former senior member of the People’s Progressive Party and a former head of that party’s youth arm, the Progressive Youth Organisation. 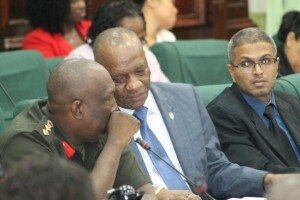 In a letter dated June 30, 2016 to Mr. Shariff, Minister Harmon wrote, “You will recall having informed me that you are now the subject of an investigation by the Special Organised Crime Unit (SOCU) of the Guyana Police Force”. The Minister, therefore, informed Mr. Shariff in that letter that he should proceed on his Annual Leave from July 1, 2016 to enable him to fully cooperate with the investigation. Deputy Permanent Secretary in the Ministry of Communities, Ms. Abena Moore will take up the role of Acting Permanent Secretary at MOTP.